As the population of the planet grows the amount of space we have available for farming is reducing; global warming is also causing abnormalities in crop production. Last year the UK suffered from a shortage of broccoli and lettuce due to abnormal weather in Spain. The overuse of the land we have means it can be expensive to bring it back to growing quality, so the sooner we can introduce modern solutions that help the environment the better! Hydroponic systems – plants grown in fibre glass on benches with ebb & flood irrigation systems, or plants rooting system submerged in water. Aquaponics – this system is a mixture of Hydroponics and Aquaculture (fish). This is a closed loop system; irrigation systems water the plants, then the water is circulated through the fish tanks and the plants use the fish waste as a natural fertiliser and remove the ammonia. Vertical farming can be compared to greenhouse production in the following way: a glasshouse has a footprint of 6 acres whereas a vertical farm can produce the same amount of produce in 1 acre of space, hence as the population increases the amount of space has to be maximised. A vertical farm uses up to 70-95% less water than traditional methods. Consistency of produce; with the correct recipes, a consistent product can be produced no matter what season we are in, meaning adverse weather doesn’t affect the produce. Time from harvest to store is typically a few hours. The days of lettuces travelling 1500 miles to our stores has to stop. Another benefit is shelf life will be significantly increased. Vertical farming cannot be classed as organic as it doesn’t grow in soil, that said vertical farming doesn’t use pesticides, which causes pollution to water, soil and air. Fish can be farmed in fresh or salt water with 0% plastic. The system relies heavily on technology and it is currently evolving quickly. The systems need to be more efficient. 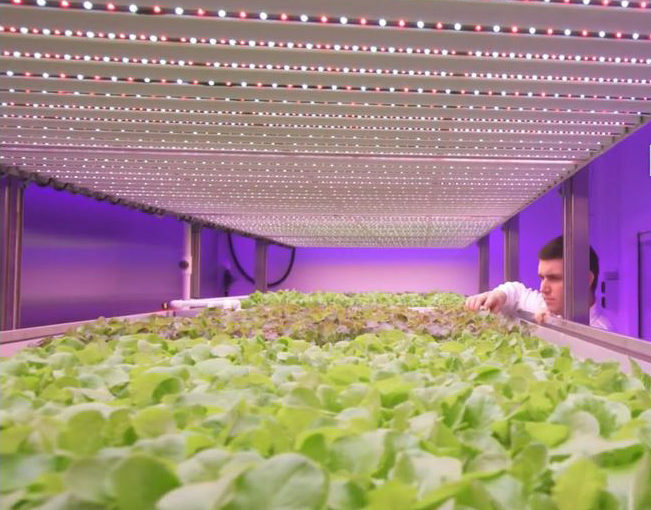 The lighting system is LED, this technology is well imbedded into urban farming. It is controllable and following in the footsteps of conventional white lighting systems which have advanced to PoE (power over ethernet) and fully wireless. The major problem is heat and putting energy in to get the heat out. The LED systems need to run cool, this will add to the benefits as it is currently expensive to control the environment due to the technology installed. This is why we are rethinking the concept; a fixture that is utilised 4m’s in the air in a glasshouse does not need to be the same intensity when it is 50cm from the plant in a vertical farm. Pollination will be difficult; we use bees to pollinate in glasshouses but it is excluded from the vertical farm process. It is done manually, is costly and requires a large workforce, which is not the most efficient way. 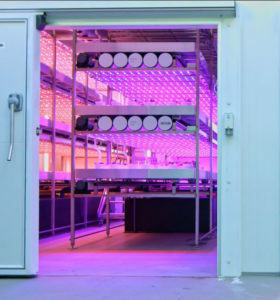 Building urban farms is a costly process: installing lighting, irrigation and a controlled environment is expensive, but ultimately for this to be successful it requires a trained workforce to be able to effectively grow without natural light. It is different from traditional horticulture as it is controlling the environment to specific parameters. This technology really works but it needs a few kinks ironing out to make it the best it can be and the benefits truly understood, there is a benefit to nutrient rich non polluted products and engineered correctly it can be comparable to traditional methods which makes it very scalable on a small footprint of land. Like most modern ideas there are still a few bits of fine tuning to do but this can only come in time when systems like this are rolled out more and trial and error can be used. The future is bright and innovation will lead the way in combating the problems of an ever-increasing population. We are lucky to be involved in projects surrounding urban farming and have knowledge of what works and what does not in certain environments, but we know there is still lots to learn. Watch this space for more urban farming updates and what is hopefully coming to an urban farm near you. UNIT 7 ACORN INDUSTRIAL ESTATE, BEVERLEY, EAST YORKSHIRE.